Below are the official 2019 Hockomock League Boys Indoor Track All Stars, selected by the coaches in the league. DUXBURY, Mass. – For the fourth straight year, perennial Div. 3 powers North Attleboro and Duxbury squared off in the playoffs. After the Rocketeers dominated the 2017 matchup, on their way to a Super Bowl appearance, the Dragons were out for revenge in the South semifinal on Friday night at Raymond Chandler Field. In a game between two strong programs that know each other well, the little things can be decisive. 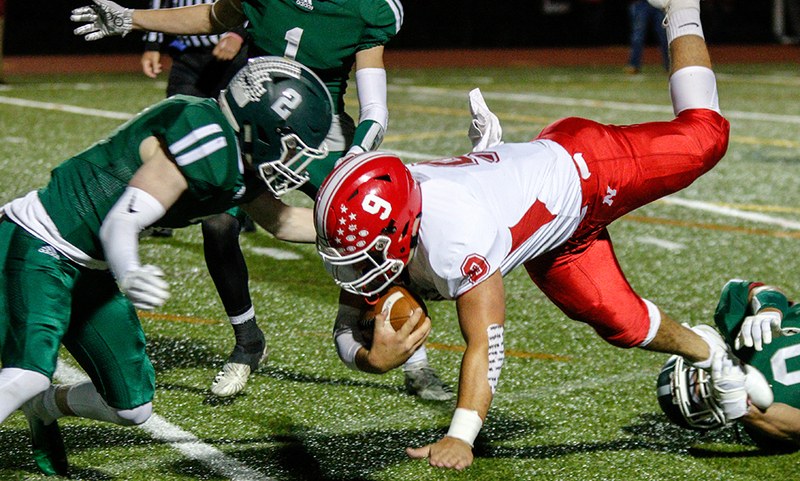 Duxbury converted two North Attleboro turnovers into 10 points, including the decisive touchdown with four minutes remaining, to pull out a 17-14 victory and advance to the sectional final. 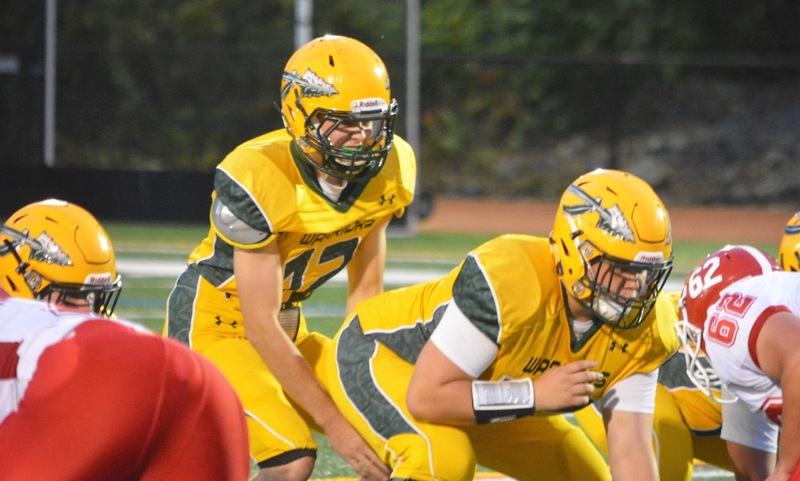 The Dragons opened the game by spreading North out with multiple receivers and finding seams in the middle of the line for senior quarterback John Roberts (17 carries, 81 yards) and junior tailback Tim Landolfi (13 carries, 59 yards). Duxbury moved the ball to the North 35, but on fourth down and inches Roberts’ pass to Will Prouty got caught in the wind and was knocked down by Ryan Gaumond. North took advantage of the wind on its second play from scrimmage with senior Nick Raneri hitting Andy DeMattio on a wheel route down the North sideline for 38 yards. 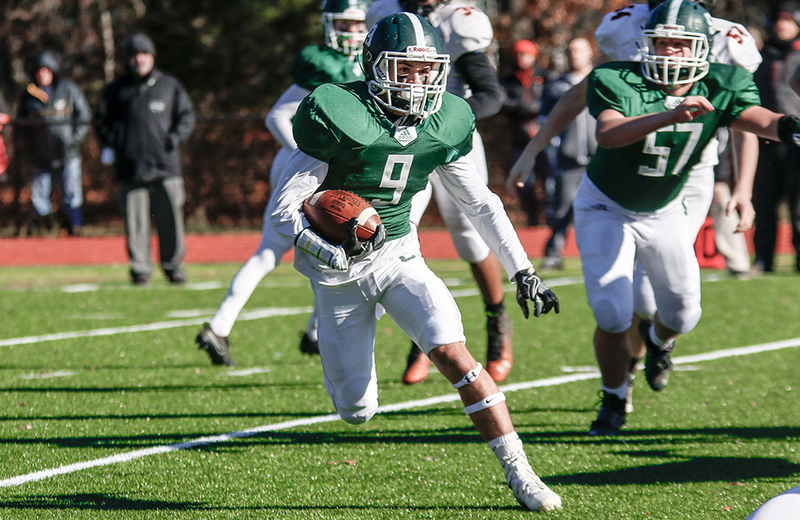 Raneri, who was also active at the start of the game in his middle linebacker position, then burst through the middle for 16 yards to the Duxbury nine-yard-line. Three plays later, Brendan McHugh bullied his way in from five yards out for a 7-0 lead. The lead was short-lived. Duxbury answered with a 11-play, 75-yard drive to tie the game early in the second quarter. Roberts (10-20, 126 yards) was 3-for-4 passing on the drive and also carried it four times, including the six-yard touchdown run. North’s offense was dealt a blow at the end of the first when Raneri was forced to the sideline with a shoulder injury he sustained while making a tackle. Sophomore Matt Penta jumped in at quarterback, and got off to a good start with 26 yards rushing on his first two plays. The Rocketeers were forced to punt and got the ball back on a fumble recovery by Omar Jasseh but were forced to punt again. Duxbury’s offense was also struggling and was forced into a three-and-out on a good play by Trevor Hewett and Ryan Clemente, who closed up the middle on a third down draw. The ensuing punt carried in the wind and Jared Penta was unable to pull it in. Duxbury recovered at the North 25. The Dragons had to settle for a 26-yard Brett Souza field goal but went into halftime leading 10-7. Raneri tried to come back in the second half and he split snaps with Matt Penta, but the North offense struggled to get any momentum. The defense came out of halftime determined to clog the middle of the line and put pressure on Roberts. Twice North forced a turnover on downs inside its own territory and Clemente was staring to assert himself at the line of scrimmage along with John Kummer. With 7:34 left in the game, North took over at its own 38. Penta (6-15, 74 yards) tried to look downfield, but his pass was intercepted by Seamus Johnston. The Dragons made the turnover count thanks to a remarkable catch in the front corner of the end zone by Prouty, who somehow managed to snag possession while on his back after Gaumond got a piece of the throw. The North bench was incensed because the Rocketeers believed Prouty had pushed off to deny Gaumond an interception. Trailing by 10 points with 4:19 to play, North put together its best offensive series of the second half. Penta found Jasseh for 25 yards over the middle to the Duxbury 41. On third down and 10, Penta threw the ball away and was gifted 15 yards when Quinn Murphy hit him late. A 16-yard swing pass to McHugh and nine-yard keeper got the ball to the Duxbury 20. A short pass got a first down but then a pass was dropped in the end zone, Prouty made a diving play to deny Jasseh a touchdown, and Penta was sacked back to the 26. Facing fourth and 18, the sophomore dropped back and threw a strike to Ethan Friberginside the five and junior dove to the pylon for the score. Tyler DeMattio made it 2-for-2 on extra point attempts to get North back within three, but his onside kick attempt was smothered by Duxbury to seal the win. North Attleboro (6-3) heads into the non-playoff round next week. CANTON, Mass. – The North Attleboro football team has waited all season for its defense to come up with a game-changing play. In the final regular season game, with their backs against the wall and a chance to share the Davenport division on the line, the defense finally delivered. With just over a minute to go, Canton found itself inside the red zone down by four. On second and eight from the 18, the Bulldogs went for the go-ahead score. Junior quarterback Johnny Hagan was forced to throw under pressure, and junior Gersom Rivera waited in the end zone with open arms, but North Attleboro senior Omar Jasseh made a terrific leaping interception to rob Canton of a touchdown, securing a 14-10 win for the Rocketeers. “We’ve been all waiting all year [for that],” said North Attleboro head coach Don Johnson. “We really haven’t gotten a big play on defense all year. We’ve been hanging in and hanging in, and relying on our offense to chew up the clock. Tonight we needed our defense to step up and we finally got that big play. Canton started its drive at the own 48 with 3:28 left in the game. After an incompletion and a three-yard rush, the Bulldogs quickly faced a third and seven scenario. Hagan hit Ryan Lentol on a hitch route for eight yards to move the sticks, Rivera (seven carries, 35 yards) picked up six yards on the ground, and two plays later Hagan linked up with Jace Emma for 15-yards to get to the North 20-yard line. Two plays later, Jasseh made the play in the end zone to deny the Bulldogs the Davenport title outright. “Credit to North, the pass rush started to get to us a bit,” said Canton head coach Dave Bohane. “Johnny is a competitor, he tried to win the game, and he took a shot. North has good coaches, and they brought some kids, and I think they made Johnny get rid of the ball differently than he normally would. But I’m proud of my guys, they battled right to the wire as usual. It was an exciting end to a second half that was dominated by both defenses. Before its final drive of the game, Canton’s first three chances of the second half all resulted in punts. The Bulldogs moved the ball 37 yards on their second drive, advancing into North territory but back-to-back negative plays forced a punt. North Attleboro’s offense didn’t fare much better, but it was enough. The Rocketeers had a little success on their first drive of the second half, but a sack from Brendan Albert put North in a hole, and Canton forced a turnover on downs at midfield. After getting the ball back, the Rocketeers hit the home run play they were looking for, but only after converting a fourth down. On 3rd and 16th, the Rocketeers spread things out but went with a QB draw and Nick Raneri (15 carries, 74 yards) sprinted up the middle for 15 yards. At their own 44, North went for it, and Raneri pounded his way for two yards and a first down. 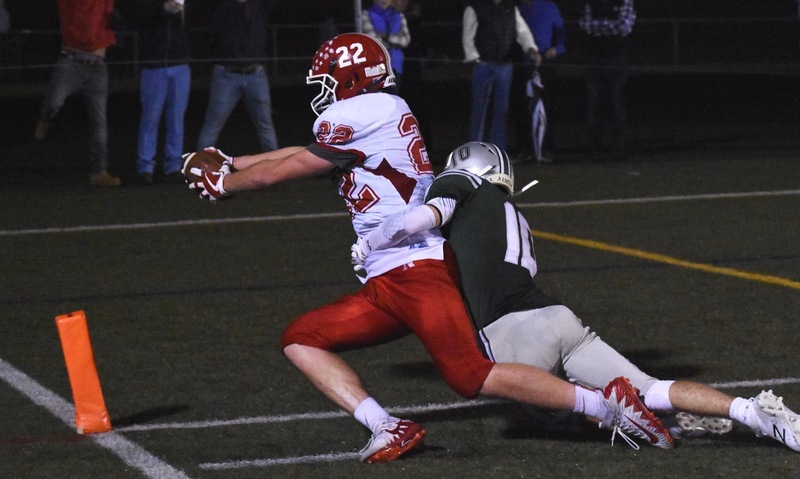 On the next play, senior Brendan McHugh (12 carries, 106 yards) came across from the right side for a sweep but instead of going all the way across, the senior cut back up a gap on the right side and sprinted for a 54-yard touchdown to put North Attleboro up 14-10 with 54 seconds to go in the third quarter. It was the only scoring play of the second half. The Rocketeers had an ideal start to the contest. Canton’s first drive picked up 33 yards but stalled and was forced to punt. North’s offense went right to work, starting at its own 10-yard line. North needed just five plays to go almost the entire length of the field. Raneri ran for 10 yards, McHugh went off for 14 yards, Raneri scrambled to find Ryan Gaumond for 42 yards and then went back to the ground for 20 more yards himself. On first and goal, Raneri kept it himself and went in from four yards out for a 7-0 lead with 5:55 to go in the first. The Bulldogs finally got things going offensively right at the end of the first quarter. Hagan ran for seven yards and hit Emma for a third down conversion. On the final play of the opening quarter, Hagan hit Kyle Fitzgerald (96 all purpose yards) up the seam for a 39-yard pass. On the first play of the second quarter, Hagan pitched it to Rivera on the right side and the junior scampered in to make it 7-7. Canton’s defense got a stop to get the ball back and used eight plays to move into North territory, gaining 43 yards. But a holding play hurt the drive and the Bulldogs settled for a 34-yard field goal from junior Owen Lehane, taking a 10-7 lead into halftime. The win gives North Attleboro a share of the 2018 Davenport division title, marking the fourth straight year that the Rocketeers have won a league title. It’s the first time in program history that North has won four straight. “It was big for us to still have a chance at the title,” Johnson said after losing to Stoughton last week. “This is our fourth consecutive title for us, no North Attleboro team has ever won four in a row. The loss last week was also our first loss in the league since 2014, so the kids were feeling down about that too. But they still had an opportunity in front of them to do what no other senior group has done, so that was a real motivator. North Attleboro football (4-1 Hockomock, 5-2 overall) likely earns a home game in the D3 South playoffs with the victory, though final seeds aren’t announced until late in the weekend. The Rocketeers will also likely return to Community Field for the first round playoff game. Canton (4-1, 6-1) will also likely host a game in Division 5 South. Foxboro, 40 vs. Coyle & Cassidy, 50 – Final (OT) – Foxboro erased a 19-point deficit in the second half, punctuated by two free throws from Ashley Sampson (15 points, nine rebounds) with 1.9 seconds left to tie the game. But Coyle outscored the hosts 12-2 in the extra period to pull out the win. Freshman Katelyn Mollica finished with 11 points in her debut. Franklin, 33 vs. Holy Name, 29 – Final (OT) – Freshman Elizabeth Wilson was fouled in the final seconds of regulation and hit all three free throws for Franklin to force overtime in the season opener. The Panthers outscored Holy Name 5-2 in the extra period to earn the win. Franklin rallied from 19-10 down at halftime, helped by holding the Naps scoreless in the third quarter. Sophomore Breanna Atwood led the Panthers with nine points, while Ali Brigham and Wilson each scored six in the win. Mansfield, 40 vs. Medfield, 23 – Final – The Hornets got off to a great start in the annual Endowment Game opener against Medfield, leading 13-4 after one quarter. Mansfield opened the lead further with a 15-8 third quarter. Maggie Danehy led the way for the Hornets with 11 points and 10 rebounds, while Meg Hill added nine points, 12 rebounds and three blocks. Sydney Mulkern chipped in with six points and, according to head coach Mike Redding, excellent defense on Medfield star Maggie McCarthy. Sharon, 43 @ Nipmuc, 23 – Final – Sharon wins its season opener and new head coach Sandra Lombardi picks up a win on her debut on the Eagles’ bench. Emma Eberhardt was the top scorer for the Eagles with 16 points and Telyshia Hebert added 10 points in the win. Stoughton, 1 @ Bourne, 8 – Final – Stoughton’s Luke Bainton got the Black Knights on the board late in the second period, converting a feed from Brendan Campbell. Attleboro, 23 vs. Franklin, 76 – Final – Franklin took first place in 11 of the 12 events, rolling to a win over the Bombardiers. Senior William Jacobs was a two-time winner for the Panthers, taking first in the 55M hurdles (8.74) and in the high jump (5-05.00). Junior Dylan Kehoe took first place in the 600M, finishing in 1:30.23 – the top time among all Hockomock runners at the meet. Attleboro’s lone first place finish was senior Alex Boedeker in the 2 Mile (10:23.23). Canton, 20 vs. North Attleboro, 80 – Final – North Attleboro junior Omar Jasseh won a pair of events, and the Rocketeers had the top performance among all Hock teams in four separate events. Jasseh won the 55M dash in 6.99 and took first in the long jump (meet-best 20-07.75). Big Red also had the best times in both relays as well as Mario Bresko’s 6-04.00 in the high jump. Canton’s Jack Healey took first in both the 1 Mile (4:55.81) and the 2 Mile (11:09.97) races. 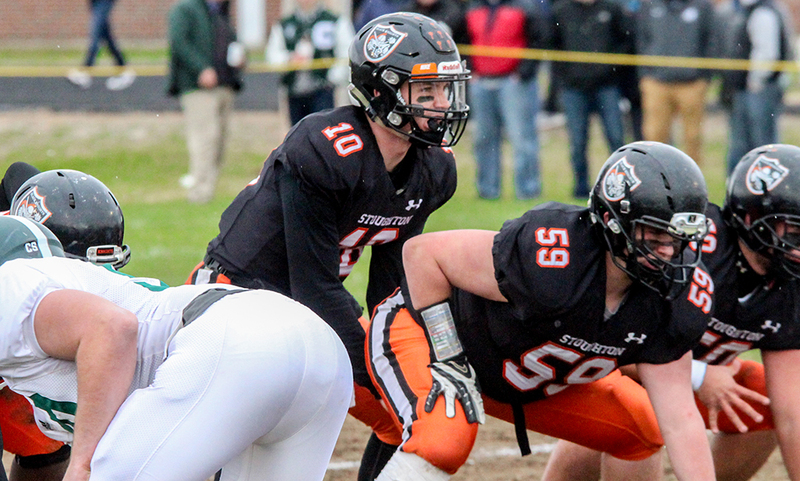 Foxboro, 46 vs. Stoughton, 54 – Final – Stoughton and Foxboro each won six events, but the Black Knights were able to pick up just enough points to edge the Warriors. Stoughton’s Ritchy Laguerre was a double winner, taking first in the 300M (37.86) as well as the high jump (5-09.00). Foxboro’s winners included Will Regan (2:48.5) in the 1000M and LJ Piazza (8.53) in the 55M hurdles. King Philip, 18 vs. Mansfield, 82 – Final – Mansfield swept first, second and third in half of the events, rolling to a dominant win over the Warriors. 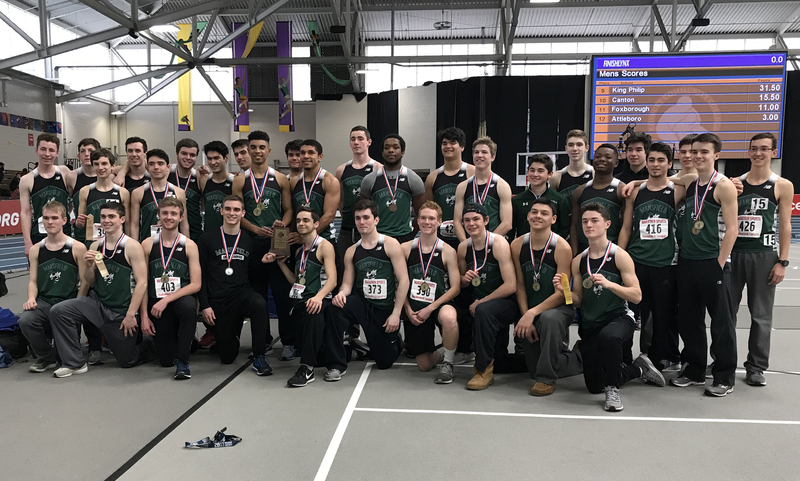 The Hornets swept the 55M dash (Greg Waters in first), the 600M (Nick Horn in first), the 1000M (Kevin Crawford in first) the 1 Mile (Patrick Heavey in first), the 2 Mile (Kalin Petrov in first) and the long jump (Jareme DiLorenzo in first). King Philip’s Aeden Angelone won the high jump (5-03.00). Milford, 42 vs. Sharon, 58 – Final – Sharon won seven of the 12 events, edging the Hawks in the opening meet of the season. Chris Gong took first in the 55M dash with a league-best time of 6.72 while also coming in first in the long jump (18-11.75). Sharon also won the shot put, high jump, 2 Mile, 600M and 300M. Milford won both the 2×400 and 4×400 relays. Oliver Ames, 69 vs. Taunton, 31 – Final – Oliver Ames swept both relays and took first place in eight events overall, earning a win in the first meet of the season. Senior John MacAdam was a dual winning, taking first in the 55M hurdles (8.66) and the high jump (6.33). Taunton freshman Nolan Tavares took first in the 2 Mile (10:59.69) and Owen O’Gara was a double winner, taking first in the 55M dash (6.97) and the 300M (37.31). Attleboro, 20 vs. Franklin, 80 – Final – It was a dominant performance for the Panthers, taking first place in 11 of the 12 events, including all individual events. Senior Jess Kroushl had a tremendous night, winning three individual events with two league-best performances. Her times in the 55M Dash (7.47) and 300M (43.84) were the best on the day, and she also took first in the long jump (16-06.75). Danielle Pierre won a pair of events, winning the 55M hurdles and the high jump for the Panthers. Attleboro’s first place win came in the 4×200 relay. Canton, 11 vs. North Attleboro, 85 – Final – North Attleboro nearly swept first place in all events, taking 11 of the 12 events to pick up a big win. Senior Rachel LaBonte was a double-winner in individual events, coming in first in both the 600M and the long jump. Canton’s Chloe Pennacchio earned the Bulldogs’ lone first place finish, taking the 2 Mile race. Foxboro, 64 vs. Stoughton, 36 – Final – Foxboro’s Lexi Quinn won both the 1 Mile and 2 Mile races and the Warriors swept both relays to earn the win over Stoughton. Quinn clocked in at 5:47.59 for the mile and had a meet-best time of 12:03.97 in the 2 Mile. 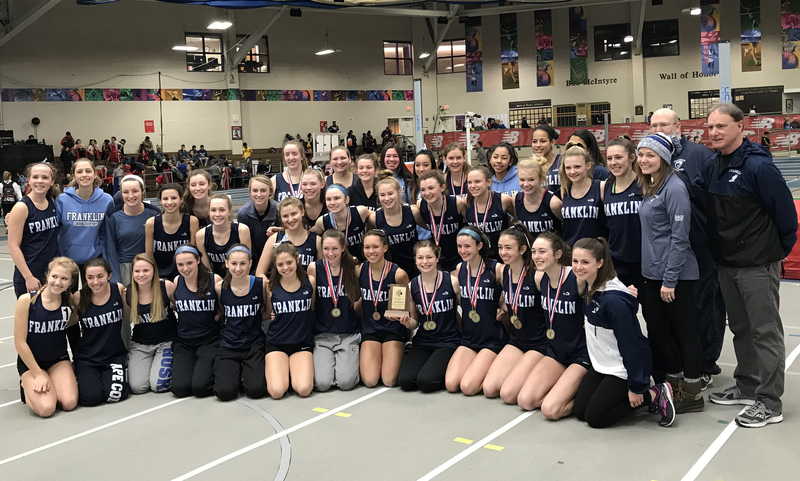 Other winners for Foxboro included Christina Rogers (300M), Emma Dahl (1000M), Kelli McCarthy (high jump), Grace Groves (shot put) and Cathy Dizney (55M hurdles). Stoughton’s Sahrina Perry won the 55M dash and Sarina Hutchinson took first in the 600M. King Philip, 37 vs. Mansfield, 63 – Final – Mansfield junior Amanda Mangano won three individual events and the Hornets swept both relays to pick up the win over KP. Mangano took first in the 55M dash (7.56), the high jump (4-11.00) and the long jump (16-02.75). Junior Val Buonora shaved five seconds off her personal best to take the 1 Mile race (5:49.80) and senior Emily Penta held off two opponents to win the 600M (1:53.38). Freshmen Emma Lamson (1 Mile) and Grace Fernandez (1000M) each contributed points with third place finishes in their debut. Milford, 26 vs. Sharon, 73 – Final – Sharon sophomore Jada Johnson won three individual events and the Eagles took first in 11 of the 12 events to earn the win. Johnson took first in the 55M hurdles (9.54), the high jump (4-07.00) and the long jump (16-07.00). Milford’s lone win came from its 4×400 team. Oliver Ames, 35 vs. Taunton, 65 – Final – Taunton took first place in the eight of the 12 events, including both relay races. Victoria Gravel won a pair of individual races, taking first in both the 55M hurdles and the long jump. Oliver Ames had four different winners, highlighted by Elizabeth Peckham’s first place finish in the 1 Mile.